You can make it even more nourishing by throwing in some bones so you get some bone broth action going too. After all, my favorite way to make bone broth is to cook a bunch of bones in my crock pot for a few days. So go again and throw a few leftover bones and maybe a chicken foot or two in the crockpot. Oh, and after you are done eating your delicious soup, make sure and save all the bones in your freezer to use in your next bone broth. Or better yet, just keep them in overnight and have a delicious, rich bone broth in your crock pot in the morning. Something else unique about this recipe is that you don’t put the vegetables in the crockpot until the last two hours. I just can’t stand it when vegetables are cooked all day in the crockpot and end up mushy and barely have any nutrients left in them. Another trick you could do to satisfy multiple diets (which we do all the time at my house) is to cook this version for you but cook some noodles separately and those who want can add noodles to their soup. My recipe library tends to be packed full of crock pot recipes because they are so magical. Recipes in the crock pot typically taste very good and they are so convenient! You can throw everything in a pot, turn it on and then you can do other things. When it is dinner time you can come back and have a great meal! I hope you enjoy this recipe as much as I did! 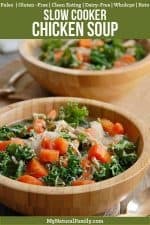 If you try this Paleo Chicken Soup Crock Pot recipe let me know what you think of it and any changes you would make! A one-pot chicken soup with a nourishing broth made from chicken bones, fresh thyme, garlic. Loaded with bright vegetables and tender, fall off the bone chicken. Place the chicken thighs in the base of a crock pot. Sprinkle the salt and pepper over the chicken. Place the thyme sprigs and minced garlic on top of the chicken. Pour the water(or chicken broth) into the crock pot. Add the chicken base, if using. Cook the chicken on high for 4 hours. After 4 hours the chicken should be “fall off the bone” tender. Remove the chicken from the crock pot and place in a bowl. Remove the thyme sprigs and discard. At this point, if you desire, you can strain the broth in the crock pot through a fine mesh sieve(if you want a broth free from any debris left from the chicken). Add the broth back to the crock pot after straining. Turn heat back to high. Separate the chicken from the bones. Lightly shred the chicken. Discard any cartilage. Add the bones back to the soup and cover and refrigerate the chicken. Add the carrots, onions, and chopped thyme to the broth and cook on high for 2 hours. In the last 1/2 hour of cooking, add the kale to the soup. After 2 hours the carrots should be soft and tender, along with the kale. Remove the bones from the soup and discard. Check the seasonings and add more salt or pepper as necessary. Add the chicken to the soup and allow to reheat for about 10 minutes. Do not stir too much or the chicken will become over-shredded. These Paleo chicken soup recipes are good for the soul and good for a cold. It is proven that chicken noodle soup has healing powers. The problem is, what do you eat for chicken noodle soup if you are on a paleo diet? I’ve got the answers right here and now. 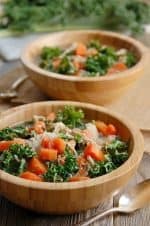 I have a list of 9 different Paleo chicken soup recipes. No noodles here except for zucchini noodles or spaghetti squash noodles and other kinds of noodles like that. These chicken soup recipes will make it easy for you to find a great recipe for your dinner! Chicken soup is simple to prepare, relatively cheap, nutritious, and easy on the digestive system. Chicken soup actually helps you recover from a cold more quickly. Sipping the soup with the steam rising up can also help clear your sinuses and help you recover more quickly. Chicken soup is a comfort food which may or may not have a placebo effect. But who cares! If it works… it works! Let us know what your favorites are. Enjoy! This chicken zoodle soup is just like your Mom’s chicken noodle soup but without the noodles and with zucchini noodles or zoodles instead. Just as comforting but a lot more healthy. You really should give this a try. This chicken soup with zucchini noodles (zoodles) is made in a pot on the stove. You can either use leftover chicken or turkey, open a can of chicken or use any kind of chicken or turkey you’d like. Be inventive, it’s kind of fun to think of different and easier ways of cooking. This is an incredibly comforting Chile Verde made in the slow cooker. It’s packed with protein, satisfying and healthy. It’s delicious served lots of avocado and my Paleo tortillas, here’s the recipe Paleo Tortillas. Homemade chicken noodle soup made with spaghetti squash instead of noodles. Sounds delicious and extremely healthy. I’m going to have to plant some spaghetti squash in my garden next year so I of can this. Of course, I could always buy a spaghetti squash at the store and make it this week. Here is a healthier version of chicken tortilla soup. You don’t need all the unhealthy stuff like tortilla chips, sour cream or cheese to make it taste good. It’s chocked full of flavor all by itself without any of that stuff. I eat it that way all the time anyway because I have to eat dairy-free. This is a really good chicken soup to help you detox. It’s load with vegetables, herbs, chicken breast and broth. This stuff I pretty darn healthy. I could cure all your ills. This tasty green chili chicken soup is made in the crock pot which makes it so easy to make. You literally just throw the ingredients in the crock pot, set it and come back hours later to find that dinner’s all ready. I serve it with things like avocado, fresh lime juice or jalapenos on top just to mix it up. Depends on the days what I put on top. This chicken soup has a combination of warm Moroccan spices and creaminess. I also have added pumpkin and noodles made out of summer squash. It’s perfect for when the weather gets cooler in the fall and pumpkin and squash are easy to find fresh. While this soup looks delicious, I don’t think you can really say that it’s Keto. There’s carrots, which are on the no-no list of vegetables for keto. I’ve read that carrots can be enjoyed in moderation on the Keto diet, so if you’re worried about it, just go light on the carrots. Besides, a serving has less than 10 net carbs, so that seems plenty low in carbs to me. Wonderful soup! Thanks so much for sharing! You’re welcome. I’m glad you like it! I love this soup! WONDERFUL flavor. Thank you! Can I cook this on low? Yes. You would do around 6-8 hours on low. I have made this soup so many times over the past almost-two years since going Paleo. It is my favorite! Even my husband, who hates all things green and vegetable-y, loves this soup and will request it when I do my meal plans. We had it for dinner this evening for the first time in a while and couldn’t stop talking about how amazing it was! The word “nourishing” is perfect here, and is one of my new favorite words since going primal. Thank you for creating such a magnificent, soothing, delicious, NOURISHING soup! So glad you guys like it so much! So do we! I absolutely love this recipe. I’ve made it twice now and it’s very soothing for my soul. I’ve been looking forward to it all day. Thanks for sharing!! How do I adjust it to use frozen chicken thighs? you might have to cook longer and put a little bit less water. If you were to do this in a pressure cooker would you cook everything at once? Or would you cook everythinf except the kale in the cooker for 30min? If you want to try it with a pressure cooker I would put it all in together. I could be wrong I have never done it with this recipe. If you are feeling brave give it a try. Would there be a way to use leftovers from a whole cooked chicken to make a soup like this? To use leftovers, you would have to either make a stock from the leftover bones in the crock pot all day then throw the cooked chicken in at the end or I always make lots of extra broth while I am at it so I can freeze it and have extras for days when I am busy. The soup looks great. Do you have any recommendations on the best way to freeze the soup? I guess I worry about the kale not being tasty after being defrosted. You’re right, I don’t think the kale would freeze super well. I would simply set aside the portion you want to freeze before adding the kale. Then you could freeze it and when you are ready to use it again, reheat it and add in the kale at that point. I have froze cooked kale in soups and it defrosts just fine as does spinach. would this recipe freeze well after cooking to serve at a later date? I don’t think the kale would freeze super well. I would simply set aside the portion you want to freeze before adding the kale. Then you could freeze it and when you are ready to use it again, reheat it and add in the kale at that point. It should freeze just fine, though the kale could be a bit soggy when reheated. You can always leave the kale out and add fresh kale when reheating the frozen soup. Exceptional! My husband and I loved this soup, and I am currently making it again using rosemary instead of the thyme, as the store was out. One of our new favorite recipes! Not only is it healthy, but it is exceptionally delicious, too! Can’t wait to try your other recipes. Thank you for sharing! P.S. 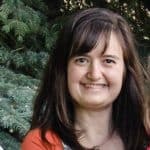 I’m switching to a mostly Paleo diet and adding exercise into my routine after struggling with infertility myself and PCOS, and my cycles are starting to regulate! Thank you for sharing your success, as it helps give me hope :)! Hi! I look forward to trying your Crock Pot Paleo Chicken & Kale Soup. I am in the process of changing my lifestyle to a more healthier way of eating. I am calorie counting so my question to you is: ‘What is the suggested serving size and how many calories per serving’? I don’t run nutrition information on my recipes, but you can easily plug the ingredients into a calorie calculator on sites such as myfitnesspal.com. Hope you get a chance to try the soup! Looks delicious…my family loves soup and this one looks great! It’s nice to have some new things to try! How delicious and comforting! Thanks for linking up with What’s Cookin’ Wednesday! I have found a kindred soul! Love homemade soup (especially for breakfast!) Love kale! Love Real Salt! I aspire to be 100% Paleo, but for now I can only claim that I adhere to a natural foods diet, low in non-Paleo cheats! Keep up the good work! I’m putting you on my follow list! I love the crock pot too! But not on days when I’m home all day because the delicious smell makes me feel hungry ALL day long. Haha! Excellent recipe, full of good things. Thanks. This soup looks so great I want to eat it from my screen but I’ll refrain. I’ll get the recipe and try it for real. this looks wonderful. Spring is on its way in but some days its still a little cool so a nice pot of soup is always good. This is easy peasy a keeper. What is Real Salt?